This short post follows a spur of the moment purchase on amazon, which has completely changed my approach to writing! Recently, a blog post on a writing blog I’ve been reading (I forget which, I’m afraid) mentioned some sort of writing guide you could pick up cheaply on amazon. So, I duly headed over there to see if it was something I could use to help me get started in writing, since I’m still in the very early stages. It was not this book, however, that caught my eye, but one by Rachel Aaron, which wasvery impressively named ‘2k to 10k’, and claimed to be able to help me increase my word count from 2,000 words a day to 10,000! Now, since I was not writing anywhere near 2,000 words a day, I felt dubious as to how much this book would actually be able to help me. But the low price, combined with the perilous 1-click purchase system on amazon (extremely dangerous, I can tell you, especially for people like me who have an unhealthy addiction to buying books! ), persuaded me to buy it. I won’t go into too many details of the book’s contents, which you can easily find out by buying and reading the book yourself (I’m not being paid commission by the author, I promise! ), because that is not the reason for this post. The real inspiration came from reading her blog. Since deciding to give writing a try, I have spent a lot of my time on writing blogs, and I have to say, although I have found quite a few good ones, hers comes out on top. Why? I think I’d have to put this down to her honesty. Her posts are personal. They are relatable. Even though she is a fully fledged author with 12 (I think) books under her belt, and I am barely taking my first baby steps into the world of writing, I still feel like I can relate to her. I’m starting to wish I lived in the USA so I could meet her! Go and check out her blog! Do it. Now! So, until recently I’d started to come to terms with the fact that feeling inadequate is just a part of life. I’ve played the piano for years, and I’ve got pretty good at it. I’ll admit (slightly ashamedly, but then again I started this blog with the aim of being honest!) that I got, and still get, satisfaction from being better than other people. But on many occasions, and especially since going to university, I’ve had to face the fact that there are a huge number of people out there who are better at playing the piano than me. They are also better at organising their lives (something I continually struggle with), are better looking than me, have more friends and are more talented in a million different ways. No matter how good I get at something, there will always be someone better. There comes a point where I have to stop and ask myself, ‘why am I doing this?’ Come to think of it, why am I doing anything at all? What, if I’m being completely honest with myself, is my true motivation in life? The answer to that question is not easy, not because it’s really that complicated, but because I’m embarrassed by it. I’m motivated by achievement. But not just any type of achievement. I need my achievements to be tangible, enviable and flauntable (is that even a word? ), to be trophies that I can subtly show off. For example, I study French and German at university, and I also speak Italian. Now, while I did actually choose to study languages because I enjoy it, I do derive enormous satisfaction from the fact that being able to speak foreign languages is impressive. Studying physics or history requires the same effort, the same love for the subject, the same perseverance and dedication as studying languages, and yet they are not trophies in the same way. They are not things that people necessarily envy about you. However, thinking about things in this way has drawbacks. I know because I experience them constantly. I know how destructive it can be to constantly compare yourself to others, bitterly envious of their success. Even if you’re at the top, it’s exhausting to try and defend that position, and you will discover that, in the end, you’re fighting a losing battle. Now, I’m not against aiming high. But I do know for sure that if your (and my) only goal is achievement and success in the eyes of others, in other words, collecting trophies, you’re ultimately destined for disappointment. So what needs to change? What does my motivation need to be if I want to gain something meaningful and lasting, and not get discouraged? I found my answer while trawling through writing blogs. In an article in one of my favourites (http://goinswriter.com/passion/), the writer, Jeff Goins, shares his own experiences of bitter disappointment when aiming purely for fame and success, before discovering a more satisfying, and more fruitful, path. He urges his readers to focus instead on the actual craft of writing, and on nourishing a passion for honing this discipline, rather than focussing on external rewards. 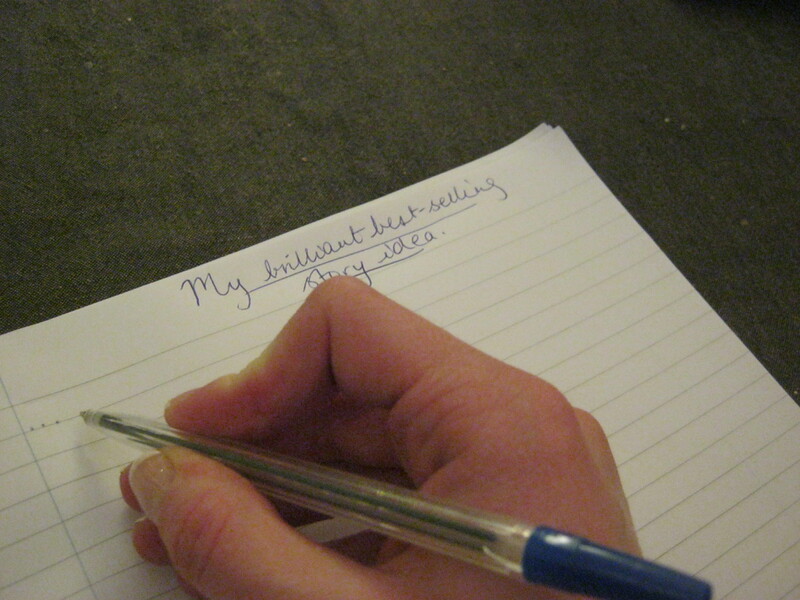 So I’m taking this tip to heart – I’m determined to embark on my writing journey with a completely new attitude! I will focus only on loving my craft, not on possible failures or successes. I will not pointlessly compare myself to others, or be envious of their skills (or, at least, I can try!). From now on, I will (try to) take Jeff Goins’s advice, and do things for passion, not for recognition. So, I’ve decided to try and become a writer. But the trouble is, getting better at anything takes practice, and I just don’t think what I’m doing is enough. I sometimes feel that there are so many ideas bubbling to the surface of my mind, but I’m not able to nurture them and turn them into anything because I lack the skill as a writer. And the confidence. So, that’s what this blog is for. It’s a chance to hone my writing skills, and maybe find out some things about myself along the way. I’m writing this mainly for my own benefit, but if anyone else reads this and gets something from it I’ll be thrilled! I have chosen to make ‘Journeys’ the subject of this blog, partly because (cliché alert!) I believe that the whole of life is made up of journeys that shape us and make us who we are. I may not feel confident about my writing skills right now, but creating this blog (i.e. grimly forcing myself to put pen to paper, or, in this case, fingers to keyboard) is an important first step in the journey of improving myself and of getting where I want to be in life. Who knows, maybe I’ll make some surprising discoveries along the way.